REVIEW - Xeodrifter - Use a Potion! Every so often a game will come along that just takes you by surprise. It may not revolutionise gaming, have the most amazing visuals out there or feature a hundred-piece orchestra; it just delivers a solid, enjoyable experience. Xeodrifter is one such game. 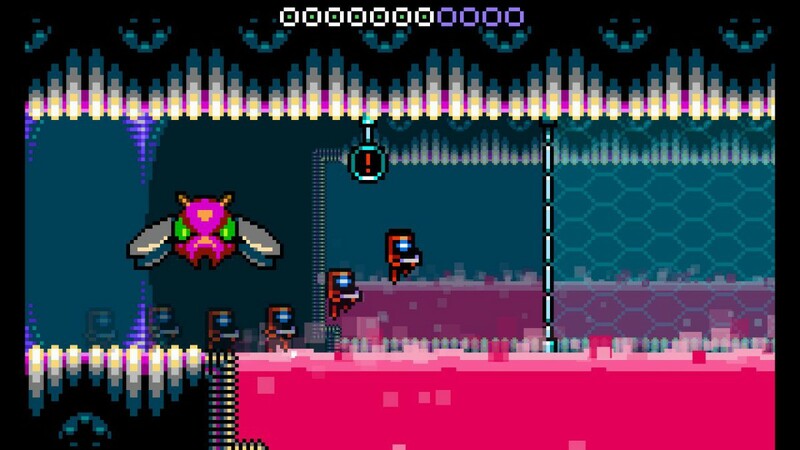 Coming from developers Renegade Kid, Xeodrifter offers a metroid-vania style experience that is clearly inspired by the likes of the classic ‘Metroid‘ series; in fact, if you squint a little you’d be remiss to not think the main character has some resemblance to ‘Metroid‘ heroine Samus Aran. Despite the essence of its forebearers being obvious, Xeodrifter still manages to have it’s own unique personality and stands on its own ground as a great gaming experience. Whilst the narrative offers context it never goes into too much detail. It opens in the depths of space with the main character flying their ship to an unknown destination. Disaster strikes, of course, when there’s a collision with an asteroid, causing the ship’s warp core to explode. This leaves the hero stranded in a solar system consisting of four planets; fortunately, a scan reveals that a new warp core is hidden on one of these four planets and thus the adventure to find it begins. As I mentioned, it offers a context but all the way to the ending it never develops further than that. It’s clearly intentional though; the games in which it was inspired by also offer bare-boned narratives. It’s not a negative point though; there’s a clear point to your mission so you know this isn’t a redundant, exploring venture. It offers enough to interest you in what you have to do, but this is certainly more of a space opera as opposed to a blockbuster narrative. You’re given the freedom to explore the planets in any order you like, though the game offers an obvious idea of how to approach it with certain planets being much more tougher than others. In fact, the freedom to explore is almost a little artificial given that you’ll be needing specific power ups that are achieved in a specific order on specific planets if you’re going to progress. Whilst the sense freedom is appreciated, it’s not until you’ve received every power up in the game that you’ll be freely exploring every nook and cranny of a planet. The planets look and feel fantastic to adventure through though. Each has it’s own unique look – one might be shades of blue with a lot of water whilst another is a more grotesque, slimy, fleshy looking level. They’re all presented with fantastic retro graphics that look somewhere between 8 and 16-bit, certainly a treat to fans looking for a nostalgic fix. Each level is full of maze-like passageways, offering multiple routes to reach your goal. You also unlock a power up that allows you to access routes in the background of a level; this layer swapping is a neat touch and integrates well in each level. 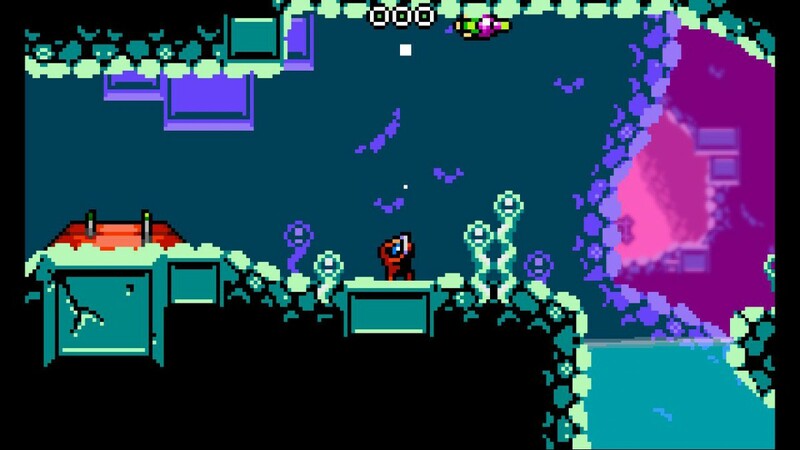 You’ll often find that the background route has less enemies or may even have a hidden upgrade; exploration is key in Xeodrifter. Other power-ups include the ability to rocket-boost yourself up high, blast through destructible walls, teleport through walls among many more. Each upgrade is unlocked by facing off in battle against one of the many bosses in the game. I feel the boss battles are a missed opportunity in Xeodrifter. Whilst they are entertaining encounters and offer you a fair challenge, each boss has exactly the same design except for a variety in colours; the only real thing that varies between each battle is that they’ll learn a new move and have more HP. Whilst the battles are tense and require a lot of precision, some of the challenge is taken away in that you learn from previous battles the boss’ attack patterns and how to counter each move. I think a bit more variety would’ve given each boss battle a bit more personality. Fortunately, the standard enemies in come in all sorts of shapes and sizes. Each is a gross alien-like creature is very well designed, bot aesthetically and with their attacking methods. You’ll have enemies shooting projectiles from all directions or some who prefer to get a bit more physical and charge at you from all angles. Akin to the level designs, the artists did a great job with the enemies. They also happen to be very enjoyable to take down; you’ll have a blast blowing each enemy to smithereens. You’re armed with what I can only describe as a space blaster that offers standard projectile shooting to begin with. This changes quickly though, with the surprisingly robust weapon upgrade system allowing you to upgrade your weapon exactly how you please. There are countless weapon upgrade points littered throughout each level and you’re given full freedom with how you spend them – if you prefer power you can upgrade the strength of each shot, if you prefer quantity over quality then you can boost the rate of fire. There’s plenty of options and the depth of the system really allows you to customise the weapon so it suits your style of play. Renegade Kid did a great job with the shooting in the game; the only downside I could possibly mention is the lack of diagonal shooting but then I’d be really nitpicking. 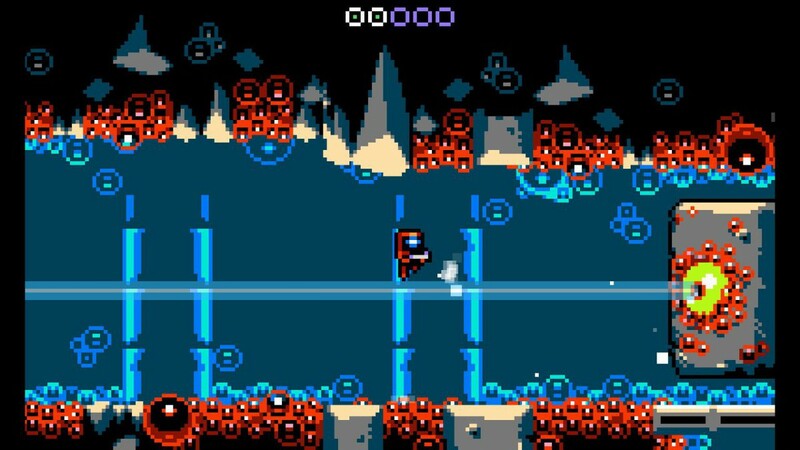 Xeodrifter can be tough game so thankfully you’re also able to upgrade your HP. 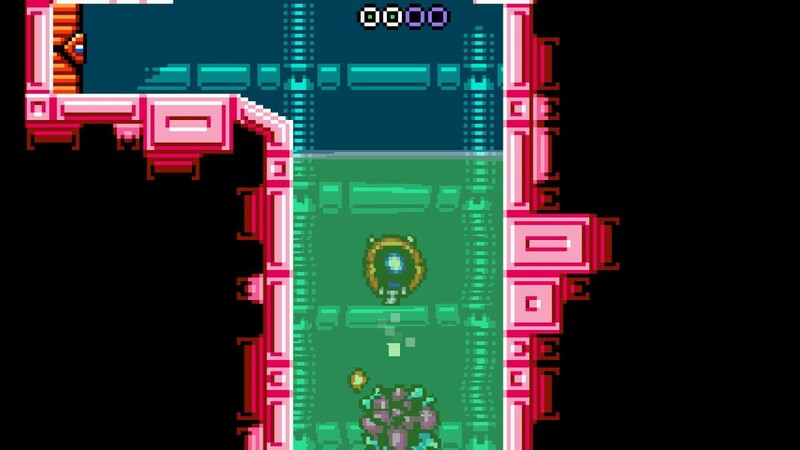 HP upgrades are typically found hidden in levels; some in plain sight but requiring the use of your power ups to access or some hidden through secret passageways. In my three hour playthrough I managed to find every weapon upgrade, but some of those health upgrades still managed to stay elude me. As if the gameplay of Xeodrifter wasn’t enough it also offers an amazing chip tune soundtrack. From the opening title all the way through to the credits, you’re treated to some amazing sci-fi tunes that wouldn’t seem out of place in some of the classic sci-fi games which Xeodrifter is inspired by. The composer did a great job; listening to the soundtrack made the exploration (and constant dying) all the more enjoyable.